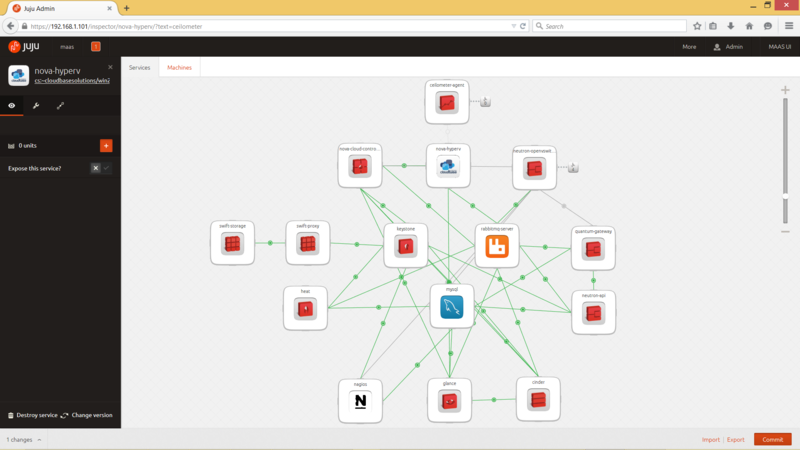 OpenStack Compute, codenamed Nova, is a cloud computing fabric controller. In addition to its “native” API (the OpenStack API), it also supports the Amazon EC2 API. Microsoft Hyper-V is an amazing hypervisor very well supported in OpenStack, with Nova, Neutron and Ceilometer drivers and agents. This charm includes also Open vSwitch for Hyper-V allowing full interoperability with KVM, ESXi and more, using VXLAN and VLAN based software defined networking. Integration with the Active Directory charm allows transparent shared nothing live migration, a Hyper-V feature that simply shines in OpenStack. Deploy the Hyper-V charm along with the OpenStack charm bundle and you will have a fully functional multi hypervisor cloud in no time, including Nagios monitoring and full Horizon support with FreeRDP based HTML5 console access. Ideally you will deploy this charm to a machine that has at least 2 network cards. If only one is present, this charm will add that interface to a vmswitch and enable management OS on the bridge itself. juju set nova-hyperv data-port="aa:aa:aa:aa:aa:aa aa:aa:aa:aa:aa:ab"
data-port Ethernet inerface to use for vmswitch. This can be a MAC address or an interface name. This option is mandatory if more then one interface is present on the target system. interface and OSManagement will be set to True, regardless of the vmswitch-management option. Avoid using the management interface as a data interface where system has more then one NIC.